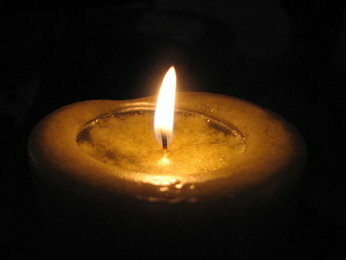 Black - The black candle is very powerful. It is one of the most protective colors. It can be used to bring a person back down to earth. It can also be used in various ways to uncover secrets. It can be used in meditation, to help us find the light within the dark. It stabilizes and awakens greater responsibility. It is most effective when burnt with a white candle and is used for banishing all unwanted energies as in uncrossing rituals, or for absorbing unwanted energies. Use also for Crone Magic, Mourning a loss, Meditation, Feminine Divinity, and Samhain. This candle attracts Saturn energy. Light Blue - Is a spiritual color and is helpful in devotional or inspirational meditations. It brings peace and tranquility to the home and radiates Aquarius energy. Dark Blue - Is the color of Loyalty and is used to promote laughter and joviality. Use it to promote Sagittarius energy. Blue - Is symbolic of the spirits of the West, and the elements of Water. It is used in rituals to obtain Wisdom, Peace, Healing, Tranquility,Truth, Protection during Sleep, Prophetic Dreams, Fidelity. Use it to promote Jupiter energy and whenever an influence needs to be increased. Brown - Is symbolic of the spirits of the North, and the elements Earth. It is used for rituals involving Animal Magic, Protection of the Home and Solar Deities. Brown candles attract the power of the cosmic influences. It eliminates indecisiveness and improves the powers of concentration, study and telepathy. Use it also for increasing financial success and for locating lost objects. Promotes Capricorn energy. Gold - Fosters understanding and attracts the power of cosmic influences.Use it in rites intended to bring about fast luck or money.When communicating with Solar Deities and for honoring the Gods.This candle generates solar energy. Use it to promote Leo energy. Grey - Is a neutral colour and is useful when pondering complex issues during meditation In magic, this colour often sparks confusion. It also negates and/or neutralizes a negative influence. Use it to promote Virgo energy. Dark Green - Is used for beauty, employment, fertility, healing, success, good luck, prosperity, heart matters, money and God energy. Being the color of ambition, greed and jealousy, it can be used to counteract these influences in a ritual. Use it to promote Taurus energy. Orange - Is used for creativity, attraction, stimulating energy, legal matters, success, new home, intelligence, control over self and mental clarity. It charges and recharges the intellect and combines with any other candles to stimulate their actions. Use for rituals stipulating Mercury energy, and sometimes solar energy. Also used during Samhain. Pink - Promotes romance and friendship,and is the standard color used for rituals to draw affections. It is used for love, honour, friendship and fidelity. A color of femininity, it brings lively conversation to the dinner table. Purple - Are used for psychic ability, wisdom, spirituality, success, independence, spiritual growth, power, healing and Goddess energy. Ideal for rituals to secure ambitions and financial rewards. Increases Neptune energy. Red - Is symbolic of the spirits of the South, and the elements of Fire. It is used for strength, courage, power, passion, health, energy, vitality, love, fertility and will power. It increases magnetism in rituals and draws on Aries and Scorpio energy. White - Is a balance of all colors and is used for consecration, meditation, healing, truth seeking,peace, spiritual strength and enlightenment,rituals involving "Lunar" energy, purity, protection, happiness, masculine divinity, and may be substituted for any other colors. Use it to promote Cancer energy. Yellow - Is symbolic of the spirits of the East, and the elements of Air. It is used for charms, confidence, attraction, wisdom, visions, psychic powers, mental mowers, activity, creativity and unity. Use it to bring the power of concentration and imagination to the success of a ritual. Also used in rituals where you need to gain someone's confidence or need to persuade someone. This candle generates solar energy. Use it to promote Leo and Gemini energy. Indigo - Is the color of inertia. It is used to stop situations or people's intentions. Use it in rituals that require deep meditation and rituals that require Saturn energy. Pray to the Goddess, who is Divine.